Vacation rental villa. Sleeps 16, 6 bedrooms, 4.5 bathrooms. No pets allowed. Greek Tourism Board License #: 0208K91000272401 Villa Nefeli is just an AMAZING place to stay… seriously, it’s positively, beautiful architecture and sea views are breathtaking…. But that’s not all!….. Completed in May 2013, Villa Nefeli was constructed under the strict guidelines of a young, visionary engineer who’s main goal was to create, not only a spectacular villa on the sea, but one which was environmentally friendly. It is one of the few homes in Greece boasting internal, green climatization which utilizes the local’s natal elements of wind and bright, natural sunlight. The result was the creation of Villa Nefeli, rich with detail ranging from inlaid, indigenous solid, marble stones, individually named living areas rich in character and charm to an outdoor conservatory of over 75 herb plants native to Greece. Taking pride in his creation, the ambitious engineer adorned the impressive villa with artworks of fellow Greeks as well marvelous outdoor furniture constructed from drift wood which had washed up upon the nearby sandy shores of picturesque, Schinias beach. It’s not just the villa which is spectacular, but the area of Schinias as well. This Athenian seaside neighborhood was the choice housing area for the US Rowing Team during the 2004 Athens Olympics as the Rowing venue is located in the area as well. 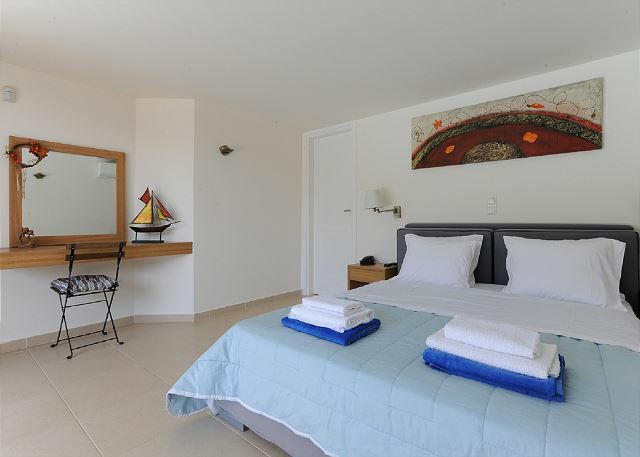 Therefore, by staying here, you can make the most of your Greek vacation itinerary by combining the unique opportunity of conveniently being able to relax in the crystal clear waters of the Aegean sea while still being close enough to Athens city to explore the Acropolis and all the historical center of Athens has to offer. So, if you are searching for a beautiful and unique, "home away from home" in the Athens area with spectacular views of the sea, close to an immaculate beach, enticing sea coves with clear, turquoise sparkling waters, with a private pool and spacious balconies for which to enjoy the breathtaking nature views Greece offers her visitors... then Villa Nefeli is the home for you! *Organizing a trip to Greece or anywhere for that matter can be a nerve racking experience. There is no need to take on the whole “itinerary” project yourself! I have years of experience of residing in Athens and know the area of Schinias very, very well.. therefore, I can help you with any question you may have so please…do not hesitate to ask! 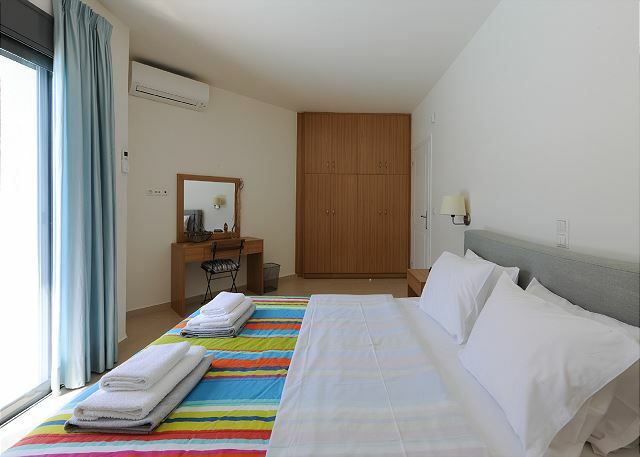 3 and ½ hours from Delphi, Myconos Island and Two hours from Korinth City. Beautiful villa in a beautiful location. We were 10 people and had plenty of room. Well planned, great for families. Lots of space inside and out. Plenty of restaurants and markets within 20 minutes drive. a guest from Offenbach am Main does not recommend this vacation rental. Landlord called us every day, that was kind, but a little bit annoying. Was not that clean that we hoped for that price. We have just spent the last 2 weeks at the beautiful Villa Nefeli. 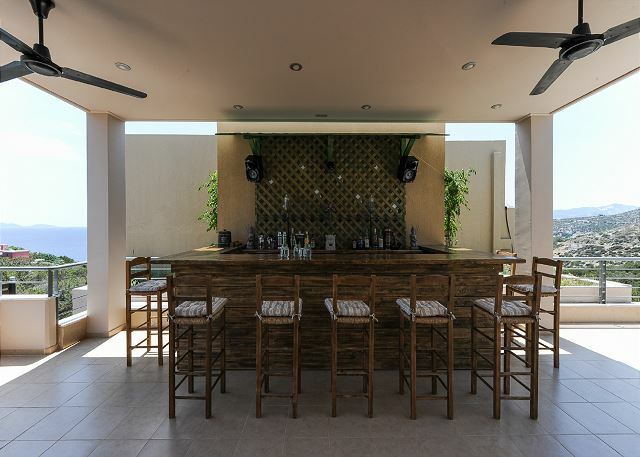 The villa is an amazing state of the art design and perfect for small or large parties. There were 14 in our family party a mix of 8 adults, 5 children and 1 teenager. There was plenty of space for us all to come together and spend time apart. The Villa was immaculate on arrival and we were met by Nikos and Giouli and their lovely daughter Nefeli. They explained the running of the house to us and we confirmed meals we had requested and a child’s party. You must try the meals they were all excellent. Nikos and Giouli were a great help and went out of their way to show us the best shopping areas, information on taxis, beach bars and beaches. There is information on sightseeing and trips in the Villa. We hired a 5 seater car ( word of warning make sure you request an automatic gear change if that’s what you are used to)! We used the car and taxis to get around when we wanted to go out. 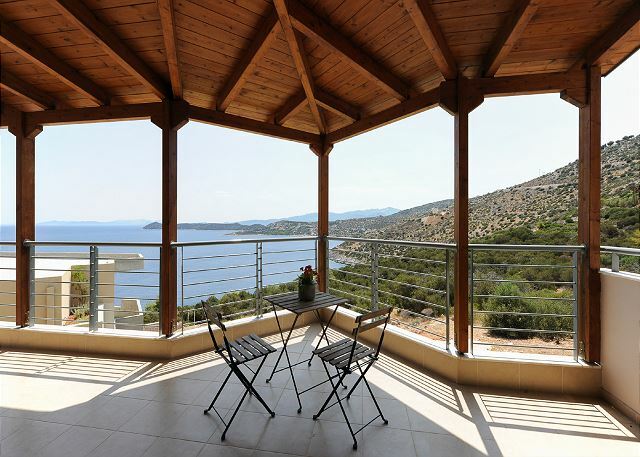 The Villa is situated overlooking the sea the views are amazing. There is a small general store nearby for essentials or travel to the village of Marathonas which has a great Patisserie, Bakery, general store, fresh fish shop and more. There are larger towns around 10 mikes away. There are 2 good restaurants nearby, the portions are enormous!!! They serve grilled meats and fish plus salads and Greek dishes. The pool in the Villa was a big hit with children and adults alike. 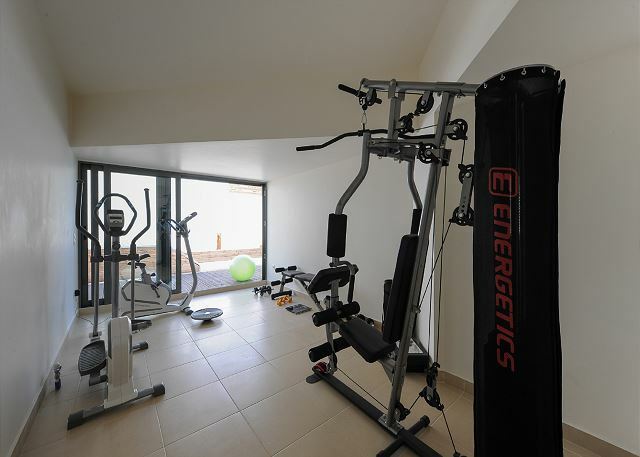 The gym was well used by the fitter family members and the bar area well used by others. Everything was provided to enjoy a home from home experience. The washing machine and drying area was a real bonus. The pool was cleaned daily so was always sparkling clean and the gentleman cleaning the pool was very friendly. We booked taxis to visit the sights in Athens or for boat/ferry trips. We fully recommend this amazing home and will definitely be returning. Thank you so much Nikos Giouli and Nefeli for sharing you beautiful home with us. Aside from a little scare caused by the proximity of the fire, we had a wonderful time in Marathon. The villa had all the required accommodations and equipment, and was clean and in good working order. Niko and Giouli are delightful hosts and helped make our stay very pleasant; we can’t thank them enough. The Greek meal the first day was delicious and plentiful. We stayed here for about a week with 11 adults and two kids (4 and 7 years). 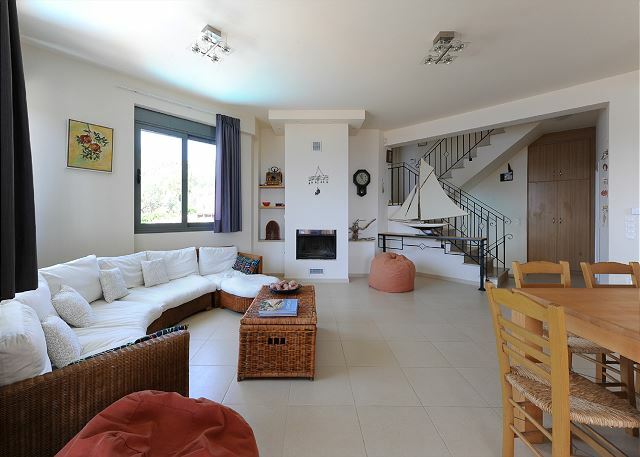 The villa has a lot of space to relax (around 6 terraces or silent corners), no matter if you want to be on your own or with all your friends together. From the "yoga deck" you have a perfect view above the bay. Our most important point was to have breakfast and lunch together with 13 persons on one table. The huge table let's you easily sit together. The barbecue corner is perfect at the evening. The pool area has perfect sun and shadow places. We would (or let me say "will") come back for sure. Amazing Villa outside of Athens! Felt like staying in luxury. We had a wonderful time staying at Villa Nefeli! The home is absolutely gorgeous. Not one complaint about our stay there. We had a fabulous time. The house had everything we needed. I highly recommend having a car though if you are going to stay there. You will need one. Each room is immaculate. It looks just like the pictures and is even better in person. Very clean. Very generous and kind owners. Check in was super easy as was checking out. This area is a nice sleepy town, we drove a few times to the beach nearby and ate in the local restaurants there. Such a wonderful and friendly community. I hope to return to the Villa again. A week end in paradise! We had a wonderful time: we were received very kindly by Nikos, who waited for us in the middle of the night to give us the keys and show us the place. 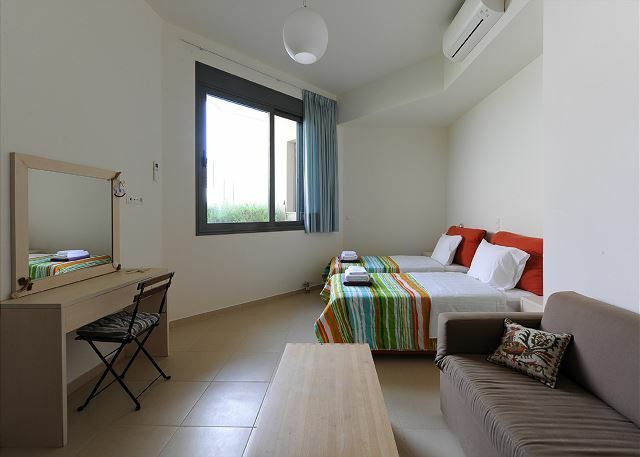 The villa is superb, spacious, so many rooms and little corners that even if you travel with a big group, you have total privacy and private space. The pool is divine. And we didn’t have time to use the outside oven! 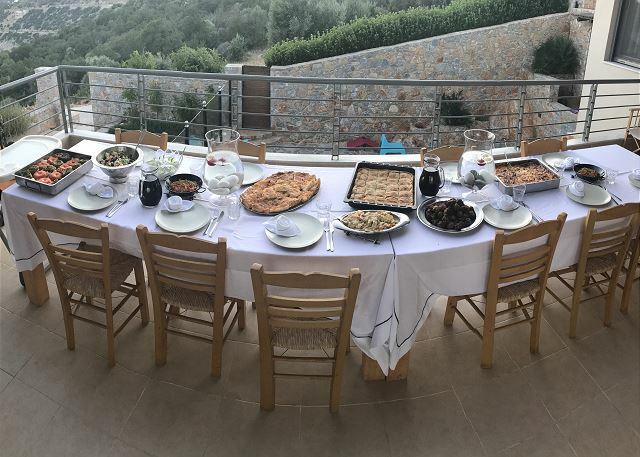 We were 8 people staying for a family week end in Greece , and the remote location made our stay perfect: we just hanged out together, went to the beach and the pool... we didn’t get bored of the house for a minute ! In a word: a little piece of paradise. Thanks again Nikos for the fabulous hosting! Well, I must say absolutely nothing what so ever. We stayed here, got married here, had our honeymoon here, celebrated here, cooked breakfast, lunch and dinner here, relaxed here. Nothing was missing, our most caring and helpful host Nikos made sure everything was perfect! Always just a phone call away to give us any information needed on shopping, places to visit or tavernas to go for food. The view is what everyone wishes for, waking up in the morning, overlooking a emerald sparkling bay. We will never forget our stay here and will definitively return to visit this amazing place! Thank you for everything! Un excellent séjour dans une villa magnifique. Des hôtes charmants et aux petits soins, une villa stress bien équipée et suffisamment proche d'athenes pour pouvoir faire plein de visites. Et pour autant suffisamment excentrée pour pouvoir profiter de superbes ballades dans la nature grecque. Villa Nefeli was the perfect setting for our family holiday. There was more than enough space for 6 adults and 4 children. Too cool to use the pool, but many places to enjoy the sun. The villa was equipped with literally everything! We had a very nice vacation, the owner is a fantastic guy. He helped us with everything we wanted. He and his wife even did a bbq for us, which was fantastic!! I recommend the villa an recommend the bbq by the owner. The villa is breathtaking! We stayed at the villa between July 16 July 28. There were 12 of us, and the villa accommodated us no problem. The location is about 45 mins from the airport but thanks to me entering coordinates wrong on my GPS and me not having Nikos' # it took us longer than that. When we finally arrived Nikos and his wife Giouli were just finishing cleaning from the last renters. They gave us a quick tour and explained a few things that we needed to know. They were extremely helpful during our stay.Nikos even drove us to the town of Marathon and showed us some good spots to buy groceries, sweets and fruits. He also gave us contact info for Stavros who was also very helpful in arranging day trips to Athens. The villa was awesome, had an elevator for my parents to go up and down as they have bad knees. The kids loved it too, I don't think they even used the stairs lol. The pool was great especially if you didn't want to go to the beach, it was a little cold at first, but once you got in it was fine! The rooms were very nice, and each one had it's own terrace. So the mornings you could walk out and enjoy the sunrise. The beach was a little farther than expected but it was still nice, also there was a spot that you could walk too but you have to be careful as it is a little tricky getting there. You will definitely need a car to get around. The driveway was a little tricky to park at first, but once you get the hang of it, it was fine! Overall the stay was fantastic, would not hesitate to go back and stay at the villa again. It was our first Europe vacation .Vills Neffeli is the place to stay .What a amazing house .Everything was just like in pictures !..Nikko and his wife Juli made our stay very pleasant .Place was spottles,kitchen well equipped .Higly recommended to get a chef at least for one fineer_ expierience you never forget. 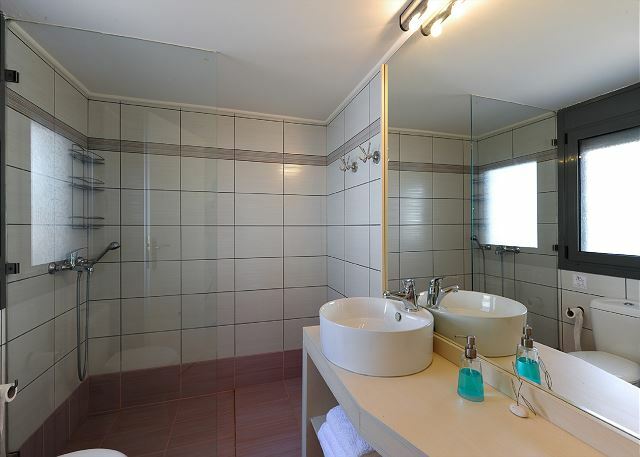 As a general opinion: if riding car each day isn't a problem for you, the house is more than ok.
Villa Nefeli is a beatifully furnished and decorated accomodation. 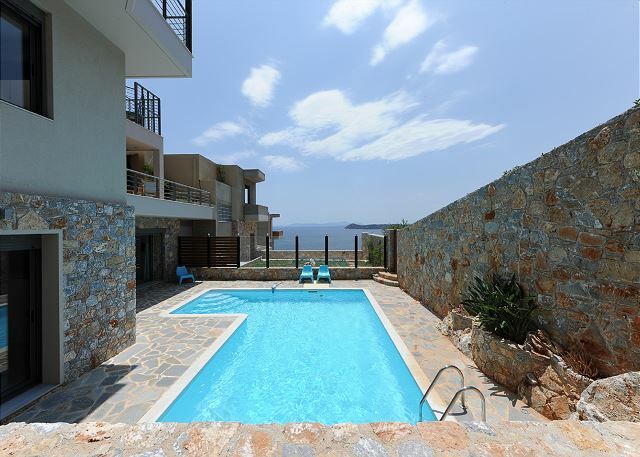 There is a lot of space, a big swimming pool, a sheltered barbecue area and various terraces, even one on the roof, where you can enjoy a wonderful view of the sea! The herbs that grow on the main terrace can be used for cooking and the barbecue for the perfect mediterranean aroma. I very much liked the modern kitchen and that there are so many sitting areas - inside, on the terraces, at the pool and in the barbecue area. Athens and the airport are quite close, a daytrip to the capital is no problem. For affordable groceries it is best to drive to Marathonas, around 14 kilometres away. We -8 adults and 6 children - arrived at Villa Nefeli in April 2017 with great expectations and we were not disappointed. 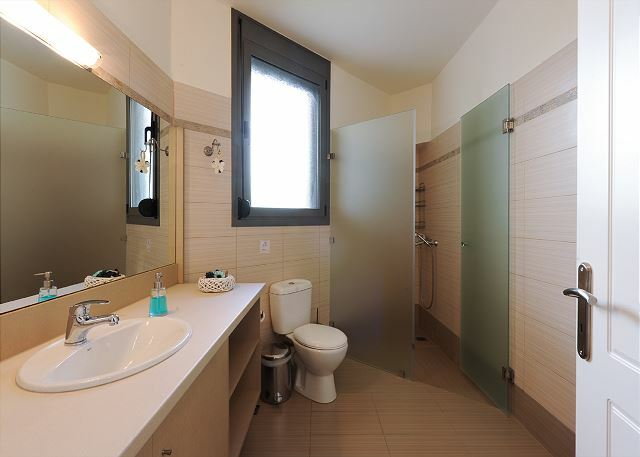 We had an exceptional stay: The hous is an architectual pearl as it is very prudently and convenient designed. It is situated in strikingly beautiful surroundings with exceptional views of the sea with its islands and treir landscapes. 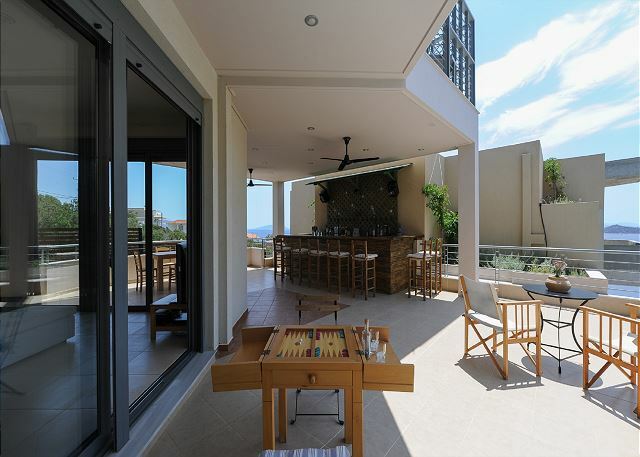 The living room, the bar and the grill area were perfect for spending time together, and the bedrooms with their separate bathrooms and balconies were ideal whenever privacy was required. The best of the best for a very good price...!!! It's a stunning house with everything one could need including an elevator. Clean and complete, it's that simple. So much space, you can get lost in this house. Pool, lounge, roof terrace and BBQ area are what makes his house an absolute winner. Beautifull views at the sea and nice and quiet area. Niko and his wife are véry helpfull. It's just a complete picture and we will return. Maravilloso lugar. Una hermosa vista y una casa con todo lo necesario.Los propietarios son muy gentiles y tienen muy bien cuidada la propiedad. Altamente recomendable. I was first greeted by the owners of the Villa Nefeli when I arrived. I should note that the hour was 01:00 in the morning as my flight into Athens had been delayed. The owners had purchased a grilled chicken dinner for me at a wonderful nearby restaurant and presented it to me in the kitchen of this villa, they then proceeded to take me on a brief tour of the Villa. Their accommodating spirit throughout my rental exceeded my expectations. The home is well appointed with wonderful décor and stunning views. It is quiet throughout the day and night and sits in a charming neighborhood perched near the summit of one of the regions many mountains. It is extremely clean, and has a multitude of sitting areas which seemed to fit every individual’s mood and optimized the location of the sun at any given time during the day. My stay was almost one week and it went much too fast. I highly recommend this villa and most certainly will visit it again myself. I have traveled to many parts of the world and I must admit that this was one of my most memorable rental experiences. This is our second vacation in this property and I'm looking forward the third next year. The Villa Nefeli was fabulous. Just the right size for our family of 11. Enough space to have alone or together time. Clean, very well maintained & equipped. Great kitchen. Views spectacular. Location a little far from Athens but well located to explore other areas. Had we been there in season the pool & patio with grill would have been a huge hit. Loved the villa & would highly recommend it. We were a group of 6 who stayed at Villa Nefelli in August 2014. The villa is stunning with more than enough room for all of us. Very nice finishes throughout. We really enjoyed it. The views from the balconies are beautiful and there is usually a very nice breeze coming in. The pool is nice to cool off in or just to sit around and relax. We really enjoyed all of the little spaces the owners have created. Makes the villa more enjoyable because you can find your own space even with lots of people. The kitchen was extremely well stocked and had everything we needed. The BBQ area is great although we never used it. The fitness room was a very nice addition. We all used it and got in some great workouts. Nice bike and a few weights makes it easy to get a workout in. Would very much recommend this villa for anyone wanting to stay in the area. 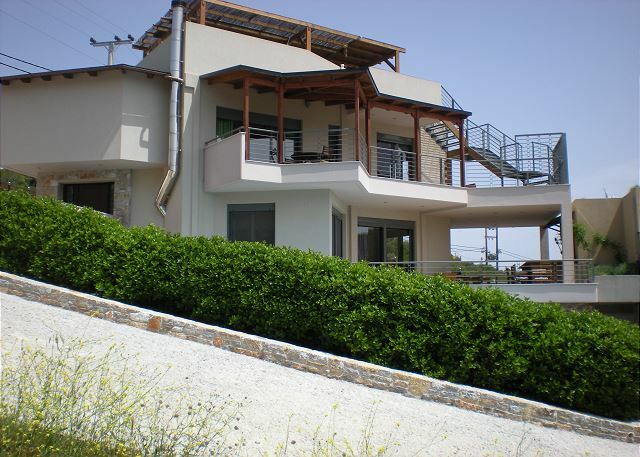 A new excellent villa with amazing sea view and equipped with everything you need to have a great pastoral vacation. We were a group of 8 (there is room for many more) and found the place wonderful. Owner is very helpful. Location is a bit off the beaten path so make sure you are setup for travel to and fro.